Skills and abilities: He is well versed in Atlantean combat methods and street fighting due to his adventuring. He is also fluent in Atlantean and English languages. Superhuman Strength: Under optimal levels, he is able to lift and move over 10 tons on land or in water. Limited Invulnerability: Highly durable-skin though not as much as his fathers. Sub-mariner: His Altantean heritage grants him multiple underwater super attributes. He can Swim at incredible speeds, breath underwater and swim as adeptly as a dolphin. He is rendered immune to cold and pressures of deep sea, able to see clearly in water whether murky or not & his strengths and health are naturally replenished in water. Enhanced Physical Attributes: His speed, reflexes, and endurance are greatly enhanced especially when underwater. Forecfeild: He can produce an invisible forcefield much like his mother can. To render himself and others invisible and create objects of varying sizes and shapes. He can also use this power to simulate flying. Flight: Despite not having ankle wings he can still fly and levitate. He does not have the longevity of a 1/2 human atlantean. On his world designated Earth 6706, Namor McKenzie was a dark skinned human/atlantean hybrid of African descent. His father wed Sue Storm at some point and he was the first born child of the couple while they ruled as King and Queen of Atlantis . 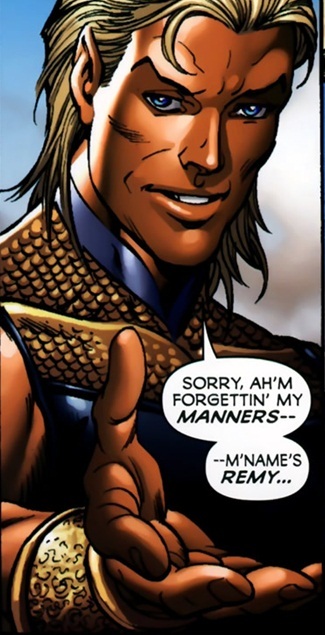 His name was given in honor of his fathers fallen friend and ally Remy Lebeau the mutant Gambit. On his world he witnessed his fathers ally T’Challa Killed because of his tolerance and did battle with a villainous Female Black Panther and her team Bloodforce. Life was a constant war and among his greatest enemies were Bloodwitch and Rough Justice. He would later welcome 4 more siblings. During the long war he would save the exiles member Rogue from certain death and later on join the team. After adventuring with them to many alternate worlds he later quits and returns to his home world where he learns that his father has died. Finally abandoning his wandering/adventuring ways he commits to the throne and becomes king of Atlantis.